It’s evident that the continuous trend of human population growth will lead to an higher global food demand in the coming years. With a projected increase in demand of 60-70% by 2050, greater food production will be required in a context where the raw inputs such as land and water, are limited. Therefore, food sustainability, which implies a better utilization of these resources to ensure food security, will undoubtedly play a key role in meeting this target. With this said, innovation in the way we produce food is more important than ever. Take for example the advanced floating hydroponic jellyfish barge – one of the more ambitious food production projects. Currently, many public and private institutions of all sizes, driven both by economic reasons and environmental consciousness, are pushing to implement systems to lower the use of the natural resources. The growing expansion of soil-less productions like hydroponics, as well as the constant interest in the development of water savings techniques, are good examples of how the agricultural sector is making significant efforts towards sustainability. A game-changing innovation has been recently developed by an Italian design think tank known as PNAT (Plant Nature and Technology). The group was founded by designers and biologists in affiliation with the University of Florence with the aim of merging plants, research, science and creativity. Their most recent – and strangely interesting – project is the floating hydroponic Jellyfish Barge. Floating hydroponic Jellyfish barge. Image via domusweb. 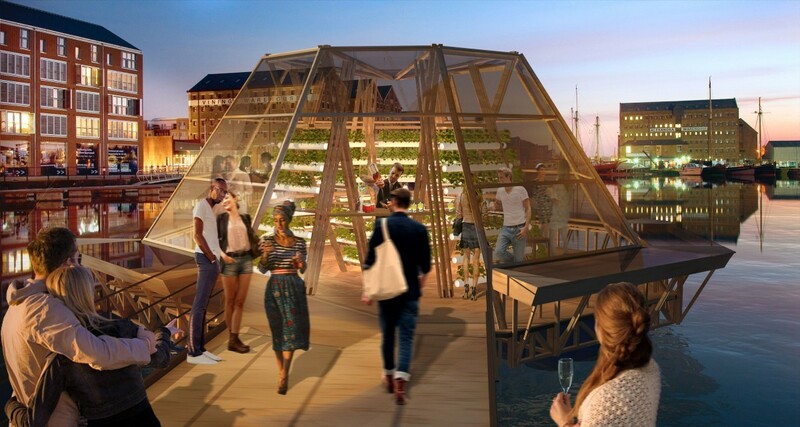 The barge is basically a self-sustainable floating greenhouse, able to produce food without soil while minimizing water usage. The greenhouse uses a high-efficiency hydroponic cultivation method which provides up to 70% of water savings compared to traditional hydroponics systems. To provide the required water, the floating module is supplied with seven solar desalination units which are used to replicate natural solar distillation on a smaller scale. In doing so, the solar units are able to provide up to 150 liters of clean water from brackish, salt, or polluted water each day. The platform of the barge is equipped with an automated system for remote control and monitoring. In addition, the Jellyfish Barge is powered entirely by renewable energy generated by on-board solar panels, miniature wind turbines, and an innovative system that produces power from tidal activity. The barge structure is made of a wooden base about 70 square meters, which floats on recycled plastic drums and supports a glass greenhouse for crop cultivation. It is built using simple, low-cost materials, but without sacrificing the attention to design. Indeed the structure, besides being useful, is also visually appealing. Many resorts are looking at it as an excellent way to provide net-zero energy food to their customers. In fact, the Jellyfish Barge can produce up to 800 crops per month, which is enough to supply the needs of a typical restaurant. Jellyfish barge: how it works. Image via domusweb. 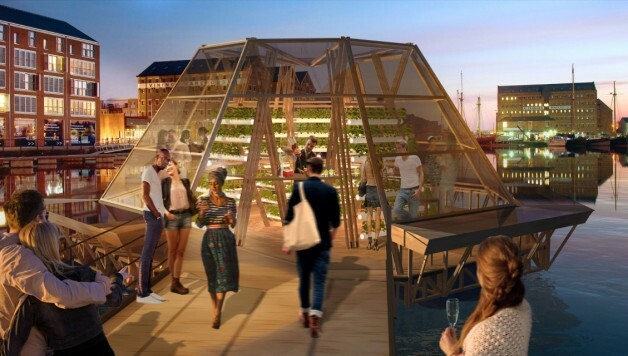 The Jellyfish Barge will be docked until September 2015 at San Niccolò Bridge in Florence, and will be presented by the Region of Tuscany at the Expo 2015 in Milan – the Universal exposition with theme, Feeding the Planet, Energy for Life. According to PNAT’s CEO, Camilla Pandolfi, this big, complicated raft is going to change the way we cultivate fruits and vegetables. Surely their project provides an attractive, as well as concrete, solution to the resource scarcity issue. It may very well be a central part of the transition toward more sustainable food industry.Featured Image: Conceptualized Illustration of the Jellyfish Barge as a Hub for Cultural Activity. Image via Seeds & Chips.